One reason that occurred to me was that the Etsy environment is perhaps saturated by jewelry artisans – not necessarily a bad thing! 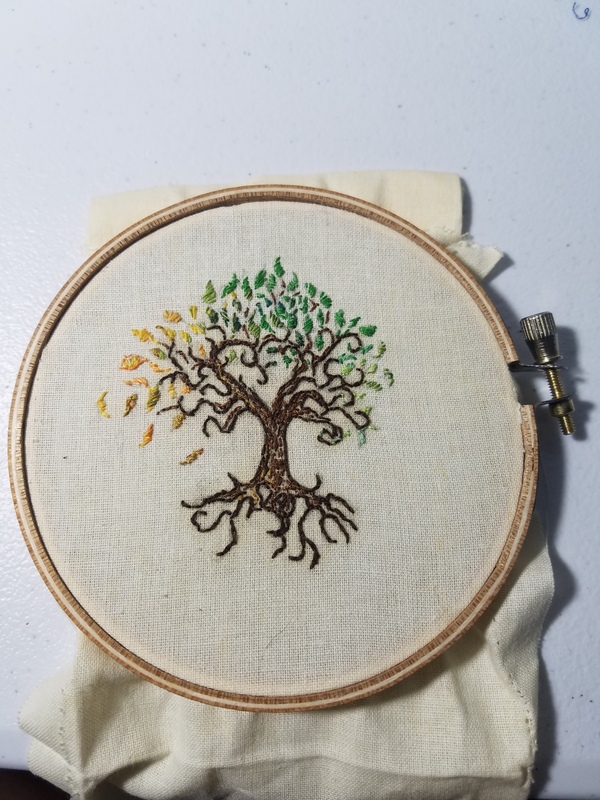 – but I was surprised to find that I personally found my niche at Etsy in custom embroidery rather than in making jewelry. Now, making jewelry has always been one of my favorite creative pursuits, as if you recall, one of the first devotional items I ever created for myself involved jewelry. What began with ankle bracelets and necklaces soon moved onto creating prayer beads that could withstand my ‘vigorous devotional handling‘ among other things. The Northern Lights Bracelet is a beaded bracelet consisting of semi-precious gemstone beads of rainbow hematite, jet, and pale blue labradorite strung on sturdy 19-strand Beadalon beading wire with a silver plated clasp. The Blood and Bone bracelet is made of 4mm beads of genuine deer bone, alternating with 4mm beads of red glass, and black glass seed beads strung on sturdy 19-strand Beadalon beading wire. Bracelet closes with a sterling silver plated lobster clasp. The Odin’s Eye bracelet is made of beads of semi-precious gemstone jet and black agate, alternating with sterling silver plated lantern spacers and beads, with one blue glass ‘eye’ bead in the center. Bracelet closes with a sterling silver plated lobster clasp. Pictures do not do this one justice! The Ember Stretch Bracelet is made of genuine red carnelian, crackled black lava stone, and red and black glass beads, with yellow brass spacers, strung on sturdy stretch silicon cord. The Silver Skull bracelet is made of marbled grey jasper and sparkling rhinestones spacers, accented with an 8mm sterling silver skull – strung on sturdy (and stretchy!) silicon cord. The picture does not show the true color and sparkle of this bracelet! This stretch bracelet consists of 4mm beads of smoky pink rhodonite and honey pine, with yellow brass spacers strung on a stretchy silicon cord. Welcome to 2019, dear readers! I hope that your holidays were bright and busy! The Crow’s Knot has a page on Facebook! Coming Soon to the shop…. 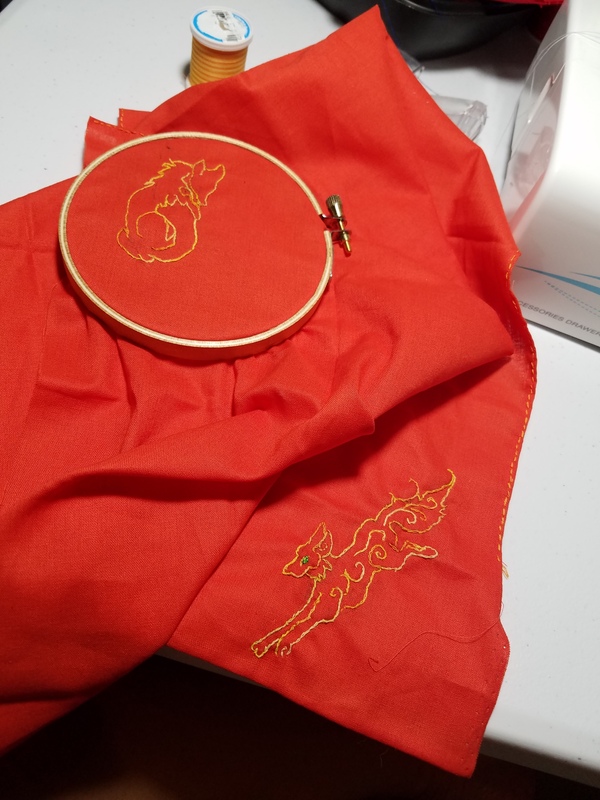 Cloth is 100% cotton, in medium orange-red, featuring a fox motif at each corner, hand-stitched in 50/50 poly cotton blend variegated thread, in various shades of yellow and orange. Finished size is approximately 19 inches square, with double-hemmed edges to prevent fraying. 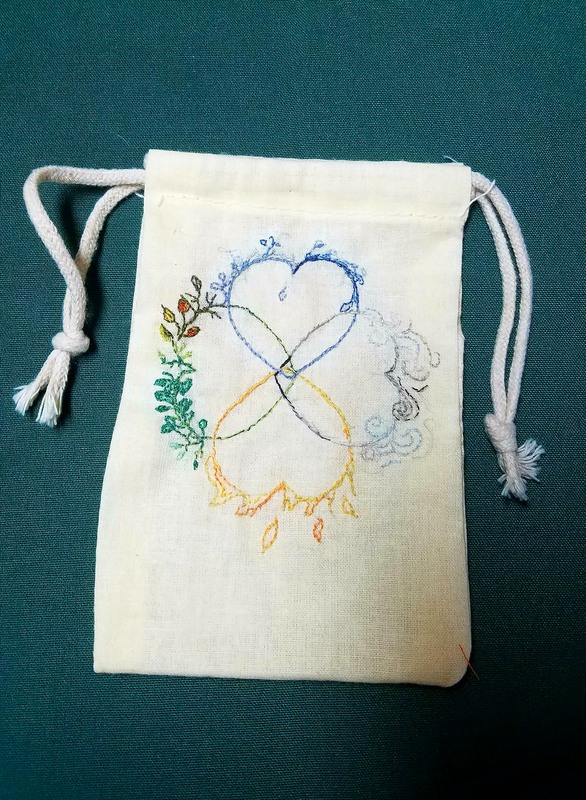 This small rune bag of 100% cotton muslin, features an intricate World Tree transforming through the four seasons – spring, summer, fall, and winter – hand-stitched in 50/50 poly-cotton thread in various earth-tones of green, yellow, orange and brown. This bag is also lined inside with 100% cotton sheeting in a complimentary tan floral pattern and cinches with a double drawstring closure. 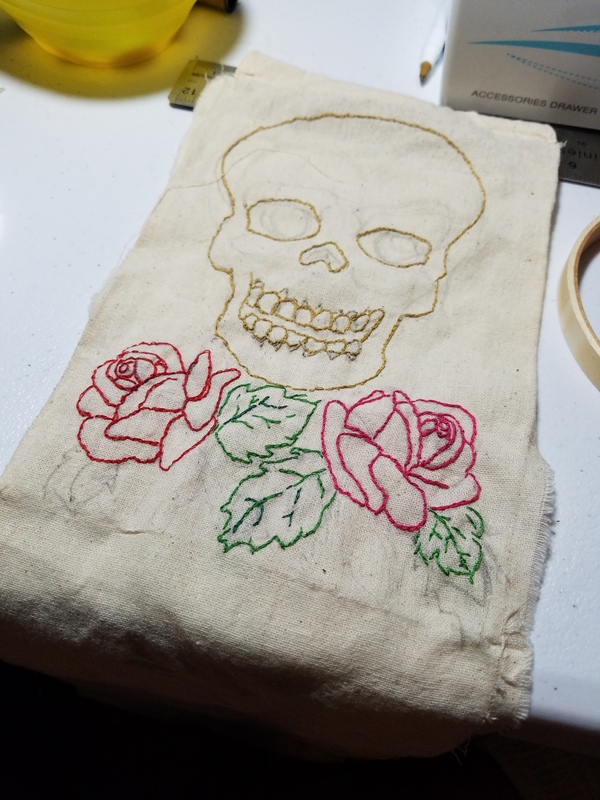 This tarot bag of 100% cotton muslin, features a hand-embroidered skull and roses motif; the skull is stitched in 50/50 poly-cotton thread in shades of brown and gold, and two roses -one red, one magenta – flanked by leaves in shades of dark and medium green, also in 50/50 poly-cotton. Bag measures a generous 5 x 7 inches, and is lined in cream polyester satin – large enough to hold your favorite standard size tarot deck – and cinches with a double drawstring closure. 100% cotton altar cloths featuring an intricately interwoven pentacle, based upon a machine-embroidery pattern created by Urban Threads. The black and purple interwoven pentacle measures 22 x 22 inches square. These 100% cotton altar cloths feature a 2 x 2-inch triple horn on each corner and varying in measurement from 14 inches to 20 inches square. This particular cloth also features a circle of Elder Futhark runes in the center of the cloth which measures 3.5 inches in diameter. 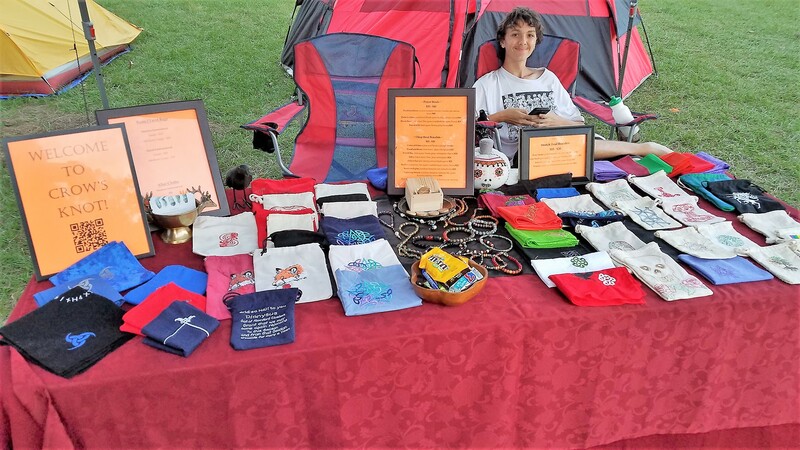 After the success of last month’s event at Florida Pagan Gathering, as well as greatly expanding my product catalog, I have opened a new shop at Shopify! Click here for The Crow’s Knot full catalog! Update: My first public vending event! 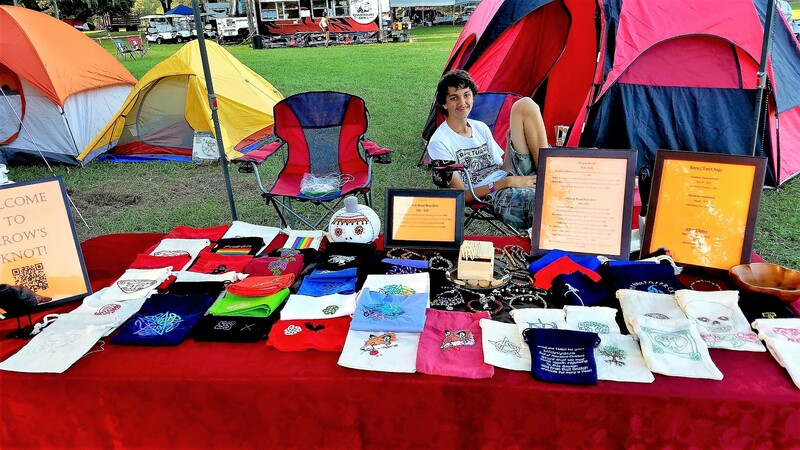 and I made my first attempt at vending at a public event! Though it was both nerve-wracking and exciting, the FPG community gave K and me – and my Etsy shop, CrowsKnot – such a warm and supportive welcome! All in all, K and I had an amazing time! While sales in April were slow, I’m pleased to say that things are looking up for May, as the beginning of the month brought me a few lucrative opportunities. Since the altar cloths and tarot/rune bags continue to be my two biggest sellers, I’ve been working to re-stock the shop with more of my bestsellers (ie, the Loki Shapeshifter cloth, the Snaptun Stone altar tokens, and rune designs) as well as some new designs that honor other Deities such as the Morrigan, Cernunnos and Dionysos. I’ve been spending a lot of time working on products for my shop, which requires me to indulge in my favorite embroidery addictions. I’m happy to say that it seems to be paying off just a wee bit – as I’ve had two sales in two weeks, and two more of my upcoming embroidery projects have garnered a lot of interest – which is an exciting and welcome distraction from the emotional intensity of the last two weeks. recently I decided to make a new altar cloth for my personal altar. I figured that I would come up with something. And I did on Monday morning. And if you know me, I like working with color blends. It’s a little more work – but I think it’s definitely worth it. a border of Elder Futhark runes. But a challenge arose with the fabric – which was a black and grey cotton tie dye – as I found myself struggling to find a color combination that would ‘show up’ against the fabric which had so much variation in color and shade. 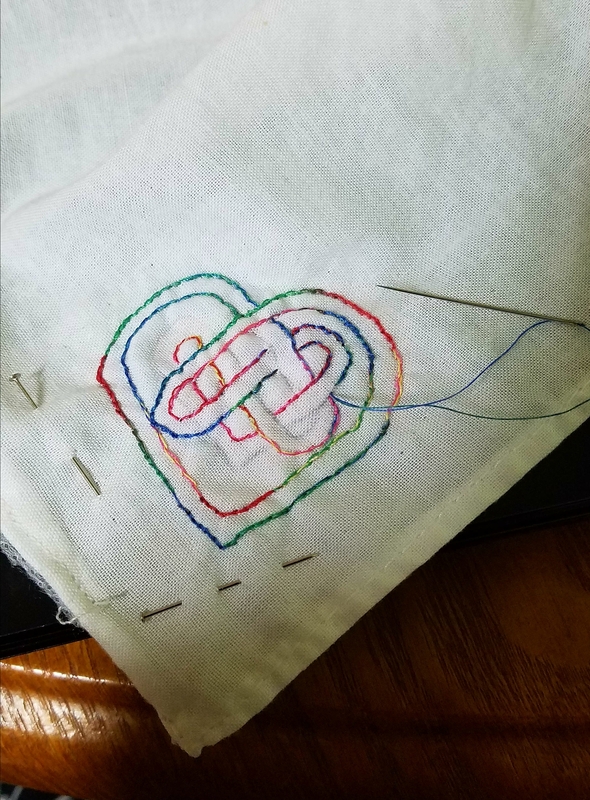 So I picked out/undid the stitching of the lavender and the grey threads, and continued the borders in a light to medium blue. Fehu to Jera on the left side…and Eihwaz to Othala on the right side. for the central portion of the altar cloth. and I really liked the way it looked. 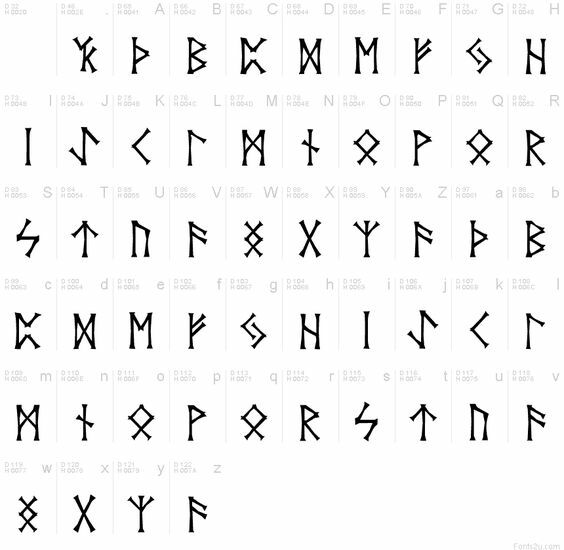 I wondered how long could it take to outline sixteen runes? I love embroidering runes (really I do!) so it won’t take long, I thought. I mean, I’ve had lots of practice, eh? to outline all of them. Well, I am a lot slower than I thought. 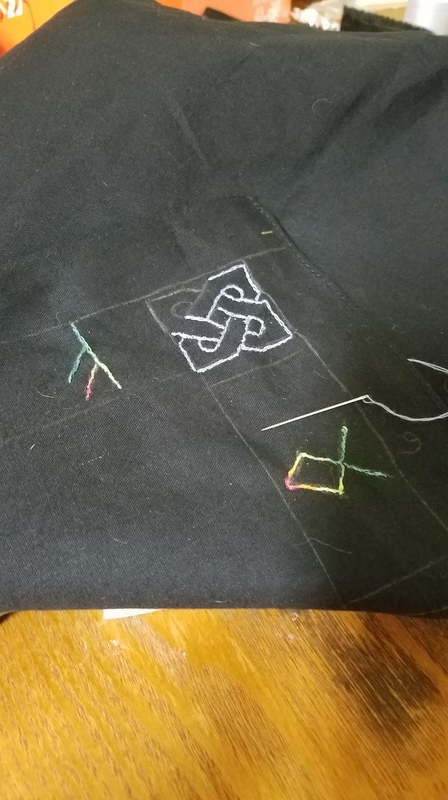 It took me almost three hours to outline just those sixteen dark blue runes on this altar cloth. So I picked, cut, and pulled out all the threads of that little swirly circular button. And then I decided, how about the World Tree? Y’know, because it’s hard to stitch symmetrical designs after midnight. And I sat there staring at it for a bit. and as the finishing touch, I stitched a purple border around the heart/triple horns. So what’s new for February at my Etsy shop CrowsKnot? Why it’s more embroidery, of course! 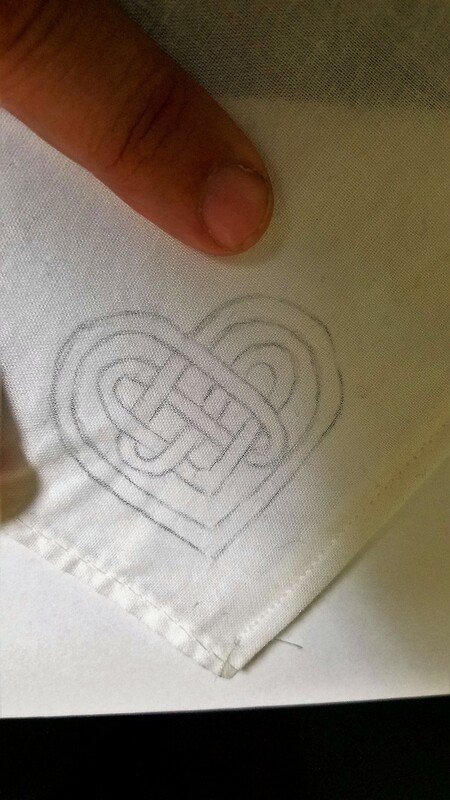 Since the month of February contains not one but *two* personal anniversaries for me, my newest products feature hearts – both elemental and of the Celtic knotwork variety. *100% pre-shrunk cotton, in white, with hand-rolled double stitched finished edges. turned out to be an unusual but welcome challenge for me. *Bag closes by a sturdy double drawstring closure. I love how the bold, bright colors of this thread just *pop* against the background of lighter fabrics! 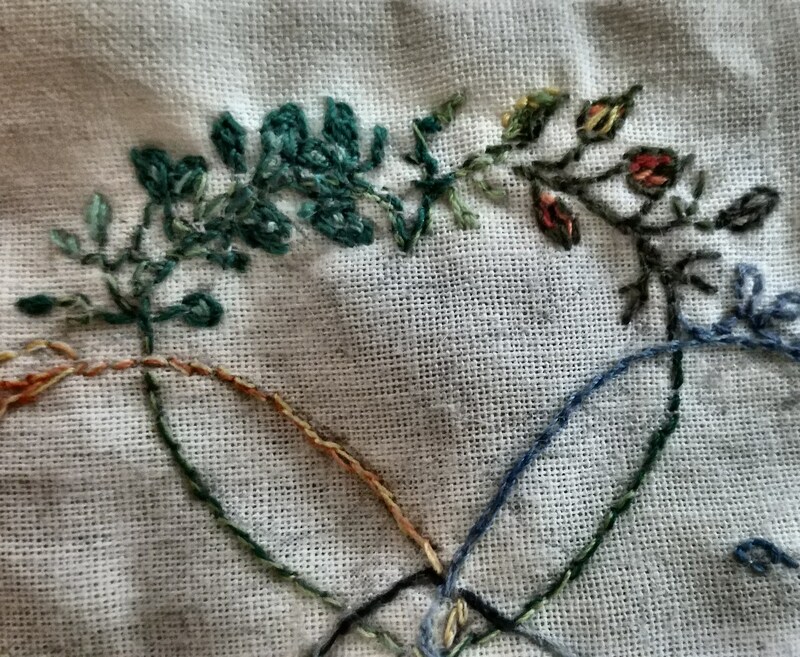 Since I have quite an embroidery addiction, I would be more than glad to create something just for you and your beautiful altar! Thanks again for stopping by and I hope that y’all have a wonderful day! ** If you do choose to contact me directly through gmail, please put ‘CrowsKnot’ in the subject header so I know you’re not spam — Thanks! Ever since I was a child and my grandmother taught me how to thread a needle – I have enjoyed hand-sewing. Something I’ve always found particularly satisfying is embroidery – so as you might imagine I especially enjoy embroidering altar cloths! This design was stitched with 50/50 polyester/cotton thread by Coats & Clark called ‘Blue Clouds’ – a cascading ombre thread in shades of blue – which made me think more of water than of clouds. It was difficult for me to decide how I wanted to convey the colors associated with air – I mean what color *is* air exactly? – so rather than using a C&C ombre thread, I decided to simply blend some of the palest blues and greys with white as best I could. As well, I wanted to show movement while still relaying a bit of playfulness. Another C&C poly/cotton ombre thread named ‘Autumn Leaves’ which uses the full spectrum of oranges and yellows, which was perfect for my mental imagery of a heart in flames. Like Air, this design features several different threads, including a C&C green/yellow ombre called ‘Spring’ along with three shades of brown to create the leaves and branches of this wreathed heart. 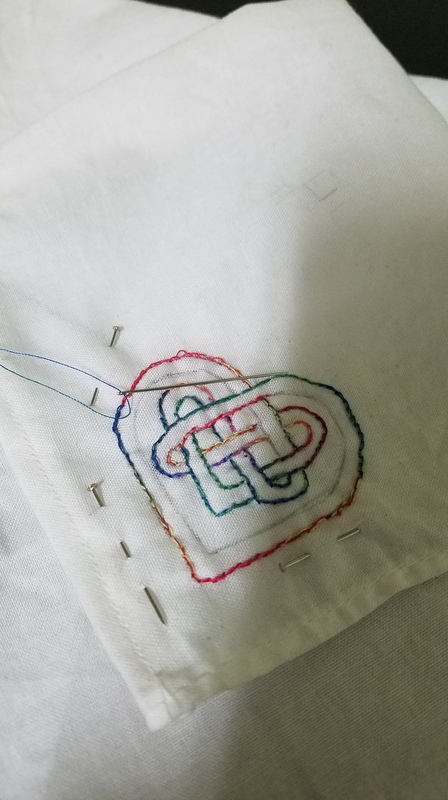 I have a silk embroidery thread that seems perfect for this project – but I’m still working on the compass rose. The actual layout of the compass rose I had planned was much more elaborate and delicate than I expected, so I have to re-work the compass before I start assembling the final design. I hope that you all had a wonderful Yule and Merry Solstice! My family and I enjoyed a lovely low-key holiday, full of some much needed down-time. 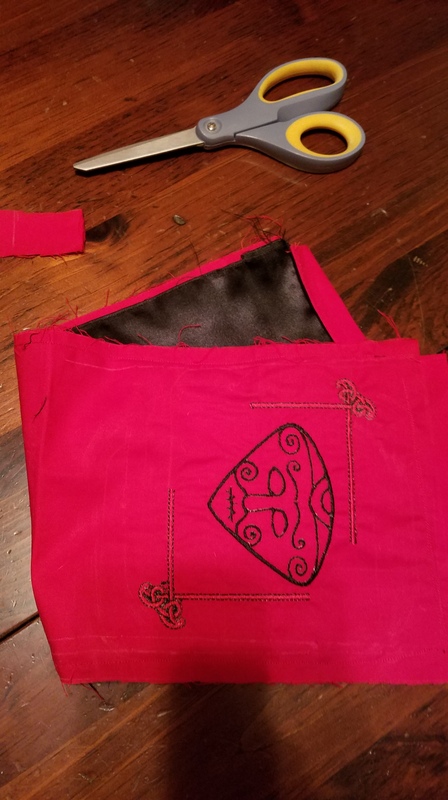 This altar cloth was inspired by an ongoing conversation taking place in one of the Lokean groups I’m in concerning instances of Loki’s shapeshifting. 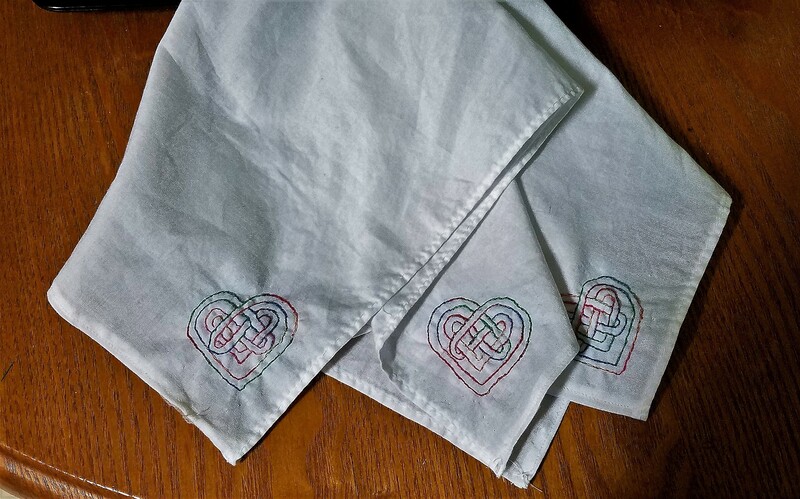 This altar cloth is made of 100% white cotton, and black poly/cotton thread used to stitch the each Celtic knot inspired design. Orange-yellow ombre thread used as a bit of accent within the eye of each form, in reference to Geirrod’s assertion that Loki is recognizable in any form by the appearance of His eyes. This altar cloth is slightly rectangular – measuring a total of 19″x 22″ inches, and is completely machine washable and dryable. 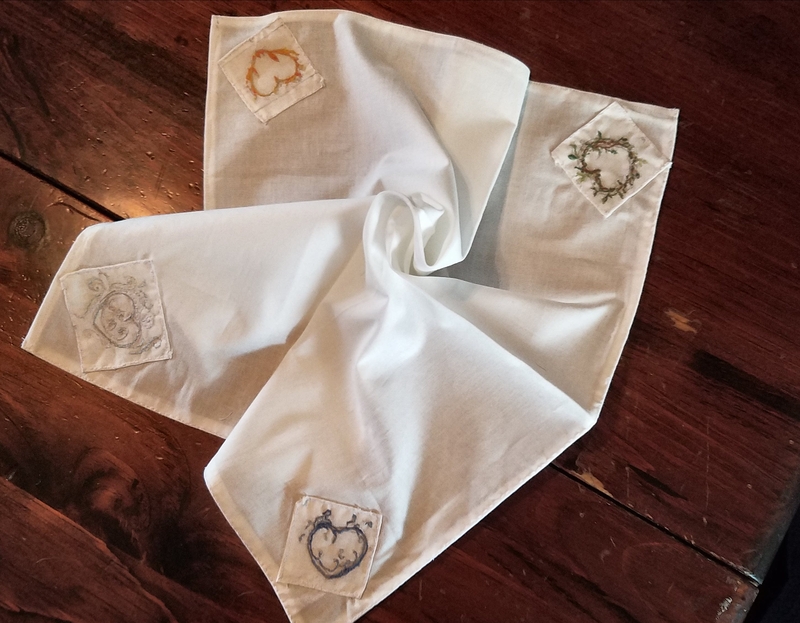 Click here and here to see other altar cloths I have available at The Crow’s Knot! I started this blog as a place to share information about my Etsy shop CrowsKnot , which is where I sell Pagan and Norse-inspired handmade jewelry, prayer beads, rune sets, and other devotional/altar items, such as hand-embroidered altar cloths, rune bags, and ceramic altar plaques. I have been identifying as a Pagan for over 25 years, and I have been making my own devotional jewelry and altar items ever since.